The pour-over, whereby your barista spiral-drizzles steaming water into a punctiliously weighed dose of ground coffee, makes an iconographically superior brew. It is also fussy, time-consuming, and ill suited to a line of waiting, undercaffeinated New York café customers. In most places, the way to resolve this dilemma is to buy a Bunn coffeepot and deal with it. In Brooklyn, the solution is to build a robot that can brew five pour-overs at a time. Its CEO, Stephan von Muehlen, spent some years at a company that built​ parts for NASA’s Mars rover, and says that the company’s goal is not to put young bearded men out of work but simply to quintuple their efforts — “repeatedly, quietly, smoothly” — and keep the pour-overs pouring at espresso speed. Five cones of coffee sit in its base; above them, a little nozzle zips back and forth, twirling out measured amounts of water in a computer-controlled spiral, resulting in coffee that is clinically, empirically, gastronomically Just Right. The Poursteady made its retail debut in July at the Café Grumpy location in Chelsea. This was supposed to be a test drive, intended to work out bugs in the system, but Café Grumpy’s baristas were impressed enough that the shop bought the machine a month later. A few dozen more have since been built or are in production, and you will not be one bit surprised to learn that they are made not in China but in a machine shop in Gowanus. 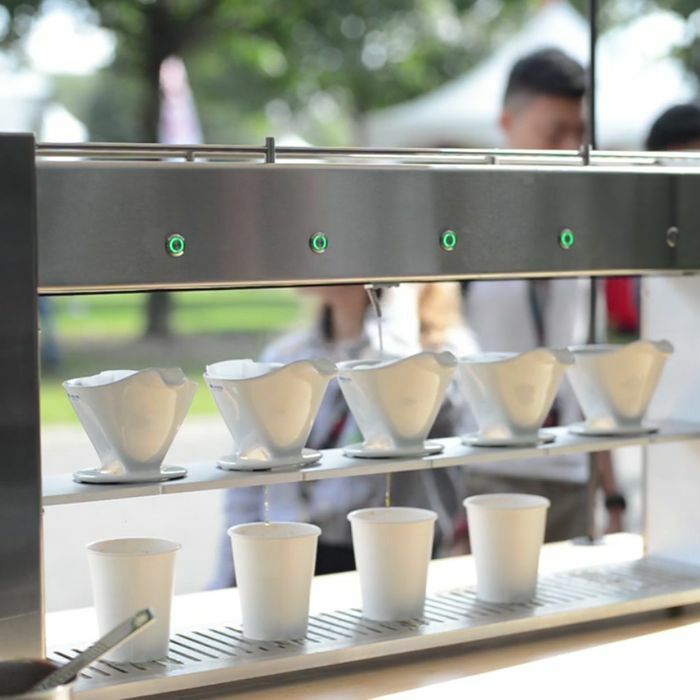 Nor will you be surprised to find that the Poursteady is controllable by its barista, to an uncanny extent: Water temperature is adjustable within a degree, water volume to within a gram, timing to the second, the drizzle pattern by its size. And, least surprising of all, those controls are managed via app. Yes, this is all so new-Brooklyn it hurts. It’s also mesmerizing fun to watch in action — almost enough to distract you from your cranky, undercaffeinated state. *This article has been corrected to show that Stephan von Muehlen is Poursteady’s CEO, not its chief engineer.